Do you have beginner ballet? Yes! 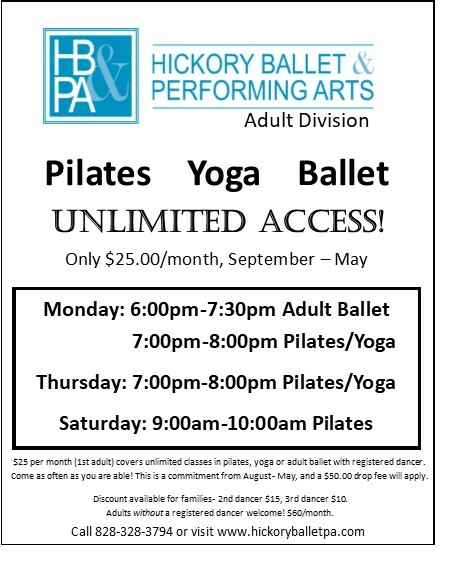 Our Freshman Ballet is for older beginners, ages 10 and up who have never taken ballet before. If your student is younger than 10, they can easily be placed within their age group. Sure! Students are allowed to attend one trial class, free of cost, in any new discipline to see if there is interest. We have an entire division for adult classes. If you have a student enrolled, you pay only $25/month! Does your studio put on a ballet/performance? Currently, we offer three productions per year: our annual Nutcracker in December, our Spring Ballet in April/May and a year-end showcase. See our dress code for what to wear to class! Can my 3 year old take ballet? Absolutely! We welcome students ages 3 and up. A 3-year-old can take our pre-ballet and/or stage presence class. See class descriptions for appropriate age levels for all of our classes. Where can I buy tights and shoes for class? Because there isn’t a dance store in Hickory, we actually offer these items for sale at the studio for your convenience! We have ballet, tap, and jazz shoes, and you can try on sizes before you purchase. Tights are available in pink and tan. There are also some other dance wear items on consignment as well.